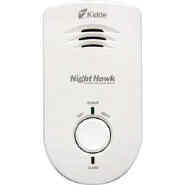 Kidde's AC Powered Nighthawk Series CO Alarms provides reliable protection with plug-in simplicity. Their small, sleek design also makes them suitable for just about anywhere - home, office, school, etc. Each unit comes with a 9V battery backup feature that provides continuous monitoring of CO levels - even during power outages. Plus, there's a peak level button, a test/reset button and a tamper resistant feature that puts units into constant alarm mode if unplugged. Alarms have a seven-year product life and are UL listed with a lifelong warranty. Size: 3" X 5.6" X 1.5"